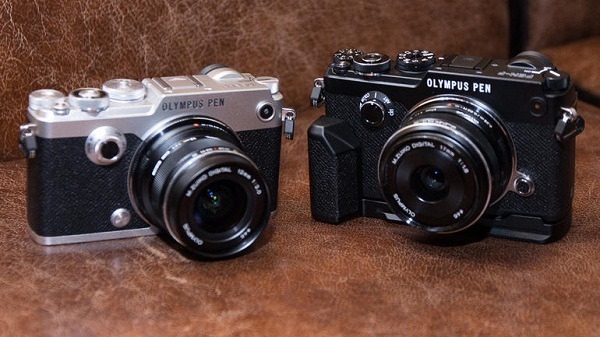 Olympus introduced in late January a new member in its catalog of mirrorless cameras, the Olympus PEN-F, with an exquisite design as its main attraction, but it contains very interesting and original arguments. So much so that this new model of the PEN series is different, so the rest of the Japanese manufacturer, and the rest of what we find on the market. Especially, to implement color adjustments like no other and controls to change filters that make it a delight to love, although not in our pocket. After the first contact in their official presentation, now we have to analyze it more calmly taking advantage of the last days of Holy Week to see how it unfolds in different situations. Its design is very attractive but also has high performance and results which are not far from the most powerful OM-D in the catalog of Olympus. No doubt that is a camera that enters the eye at first glance. It’s nice, very nice. A design very carefully to detail, exquisite and recalls (following certain design trend that takes imposing) the veteran analog PEN, with which keeps striking resemblance. Its construction also leads couple a finish that brings out, even more, the design concept. The absence of screws at first, resistant dials on the top (not both buttons on the back, something small), nice grip, rough finish and the inclusion of some controls that attract attention; As the dial switch, located on the left, distinct and possessing sufficient hardness; Maybe not the most ideal location for anyone looking for a fast on, but not supposed impediment to do so swiftly and safely. Besides the usual dials modes, exposure compensation, trigger … we also find a dial that characterizes this PEN-F. It is located on the front of the camera and is not particularly discreet (considering its options could have hidden something else). It serves to activate color and monochrome modes with a simple twist; so no need to go to the menu and find the options to enable these modes, something that perhaps, therefore, sealant used less frequently. With this facility is instantly put the camera in a monochrome mode which is a delight for those who like photography in black and white? It should also be noted that the results are pretty good in general and that encourage even more creative options to play with him and look more pronounced effects. In the rest, we found a touch screen (3 – inch LCD and 1,037,000 points) and completely folding in all angles and also folds inverted. Ideal when you are not going to use the camera and protect the screen from scratches, but also when we seek maximum discretion. The electronic viewfinder is truly magnificent. It is the first PEN model that incorporates and makes it big because it is a type OLED display with a resolution of 2.36 million dots. Of course, a recommendation: do not use automatic adjustment, since in dark situations showed the brightest scene of the account (in some cases too) by which we can confuse capture. Best manually adjust and change as necessary. What is missing? If the design was sealed splash, it would be really perfect. And for the price of this camera, we might almost say that should have been included. It has no built-in flash (although shoe connection) but a small flash as an accessory. Another very positive element including the PEN-F is the stabilization system five axes, a system that is proven and with great results in their sisters of the OM-D family, and that this PEN-F shows that Olympus has achieved great maturity in its development. And it really is effective. Until five steps as presumed in the data sheet? Well, that depends on the scene, focal length, shutter speed and our pulse, but it really works very effectively and it shows, especially in complex scenes when you do not have many options and do not want to raise the ISO sensitivity too high values. Other features that show that Olympus has very fond of this PEN-F is its system of autofocus 81 points, It has not opted for a hybrid approach, which increasingly is imposing more mirrorless cameras high performance (as has some OM-D), but the focusing system by contrast works effectively in most situations. It is fast, but for the price and category of camera I had not been bad the hybrid system had further increased its ability to autofocus. This pretty PEN-F allows for a maximum shutter speed of up to 10 fps, which is enough to the camera and while maintaining focus, exposure and white balance first shot. If we want to vary we are left with 5fps, more than enough for enthusiastic users and even some action scenes. An added option is the shot that includes high resolution. Recall that features a 20 megapixel sensor, but includes a shooting mode that we saw in the OM-D E-M5 Mark II. An intelligent mode that makes use of the stabilization system to move the sensor between eight images in a sequence that captures, with a resolution of 20 megapixels each (with certain limitations in catch in speed, aperture and ISO). Catches are merged into a single image that provides a final JPEG file of 50 million pixels and 80.6-megapixel RAW file. A recommended only for static scenes option (requires that the camera is supported or tripod) and whose effectiveness is well achieved, although its practical use is not very frequent. On the video side , we did find that the options are not very ambitious (no 4K, for example, although curiously the option to make time-lapse), but enough to record in Full HD (1920 x 1080) in a range of 60p , 50p, 30p, 25p, and 24p. Yes, no external microphone port. It is not a camera for videographers or more demanding in this sense photographer. As indicated in the design of the camera has included a new dial for selection of color modes. This is one of the most curious and peculiar features of this model. Not only because it invites to play and use creative modes and filters that simulate different finishes than any other model, but also because it has some software options to modify the color settings to the taste of each. It’s really funny to handle the color curve and configure it to achieve results that satisfy us (can control saturation 12-tone to be adjusted individually or together through 11 steps, from -5 to +5). And do it instantly, capture, without having to spend a lot of time after post-processing files. We capture a JPEG with our custom color settings and also have the RAW file if we repent or want to do some variation based on the original capture. It must be emphasized that the PEN-F includes a sensor with 20.3 effective pixels, which is a considerable increase from the current PEN other models, and even OM-D. As a result, it is shown improved detail in catches with low ISO values and this makes it the best Olympus in this field so far. Of course, when we increase the sensitivity, loss of detail and make it stand out in this regard. Although allows higher values, we have found that an ISO 6400 may be the maximum tolerable value in most situations. Shows some noise, some loss of image but is quite acceptable, although significantly better if we stay with ISO 3200. All this if we do not work with the black and white mode, where the noise along with the good work of monochrome filter provides results with very high ISO values and do not spoil the overall look. Two aspects that have found room for improvement for Olympus facing the next generation is the dynamic range, but especially in the auto white balance. In fact, it is the aspect that is striking when seen not get an acceptable result for catches look on the screen (or when viewed on the computer during the post-processing). Even using some of the custom modes, we have not been very pleased with some scenes. For many it may be a minor problem that can always fix later, but considering how complete this PEN-F stumps, this aspect of their overall quality deteriorates somewhat. This is a very nice camera attractive, design and surely will delight many enthusiasts who already have a PEN taken to the eye. This PEN-F stands and undoubtedly cares details help convince even more when you have hands. An exquisite packaging, finishing, and sensations offered are really high and one of the most beautiful cameras of the current window. It is ideal for enthusiastic users and especially suitable for travel photography and street photography because it is small, discreet and quiet. As for image quality, Olympus have wanted to place it as the queen of the PEN range , with the essence of the family but incorporating powerful features of the most ambitious OM-D. And increased sensor resolution is proof of this, which puts it at the highest level. The behavior of the sensor is very good in quality especially with low ISO values when the sensitivity is increased does not stand out much. Good point incorporates the high-resolution mode, but stresses, above all, its excellent stabilization system and its commitment to the filters and custom color modes in a very convincing and serious way. Management, design, display and variable angle screen are other positive aspects, the less the small buttons on the back. Yes, the automatic white balance has not found it very reliable and the ability to video recording is not very ambitious (but probably enough for those who occasionally records some clips), but as a whole is a complete and balanced camera, although account with a high price will be its main handicap. The design care and all its services have to be paid. And for that price, any potential buyer will have doubts among this pretty PEN-F or the powerful E-M1. In the design and use will be the key.